Tiffany Haddish and Andy Serkis will announce the nominations for the 90th Academy Awards Tuesday, January 22, at 5:22 a.m. PT (8:22 a.m. ET). Set your alarm clocks. It’s Oscar nominations time early Tuesday morning! 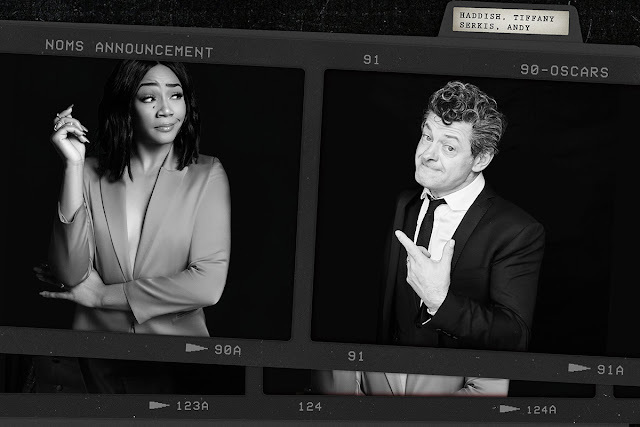 Tiffany Haddish and Andy Serkis will announce the nominations for the 90th Academy Awards Tuesday at 5:22 a.m. PT (8:22 a.m. ET). They will be joined in pre-taped segments with special guests Priyanka Chopra, Rosario Dawson, Gal Gadot, Salma Hayek Pinault, Michelle Rodriguez, Zoe Saldana, Molly Shannon, Rebel Wilson and Michelle Yeoh. The format of the announcement will be similar to last year’s new “global live stream” and forego the standard live press conference format. What time are the Oscar Nominations? Honolulu - Tuesday 3:22 a.m.
Los Angeles - Tuesday 5:22 a.m.
Denver - Tuesday 6:22 a.m.
Chicago - Tuesday 7:22 a.m.
Detroit - Tuesday 8:22 a.m.
New York City - Tuesday 8:22 a.m.
London - Tuesday 1:22 p.m.
Paris - Tuesday 2:22 p.m.
Berlin - Tuesday 2:22 p.m.
Rome - Tuesday 2:22 p.m.
Zürich - Tuesday 2:22 p.m.
Cairo - Tuesday 3:22 p.m.
Athens - Tuesday 3:22 p.m.
Cape Town, South Africa - Tuesday 3:22 p.m.
Istanbul - Tuesday 4:22 p.m.
Moscow - Tuesday 4:22 p.m.
Dubai - Tuesday 5:22 p.m.
New Delhi - Tuesday 6:22 p.m.
Bangkok - Tuesday 8:22 p.m.
Hong Kong - Tuesday 9:22 p.m.
Tokyo - Tuesday 10:22 p.m.
Sydney - Wednesday 12:22 a.m.
Academy voters finalized their nomination ballots and submitted them by the 5 p.m. PT deadline Friday. Accounting firm PricewaterhouseCoopers LLP tabulated the results and nominees. This includes the always compelling Best Picture category and how many nominees there will be – between five and 10. Stay tuned to TheGoldKnight.com for full coverage. The 90th Academy Awards, for outstanding film achievements of 2017, will be presented on Sunday, March 4, 2018, at the Dolby Theatre at Hollywood & Highland Center, and will be televised live on ABC and in more than 225 countries worldwide. Jimmy Kimmel hosts.